Staff get an iPad in their work area to guide them through their work for the day, and give them the information they need to do it. This is the Systematic station view. Tasks Staff see at a glance the tasks for the day. Start a task, and run through its checklist to ensure nothing is missed. Checklists can include guides for new staff, such as a picture of how an area should look. Forms Instead of chasing paper forms, staff access the forms for their work area electronically, and submit them direct to a manager’s inbox, or have them delivered externally (e.g. email a stock order). Documents Access a library of reference documents, videos, or photos, including example menus, recipes, standard operating procedures, manuals, and catalogs. News Check the in-app staff notice board. 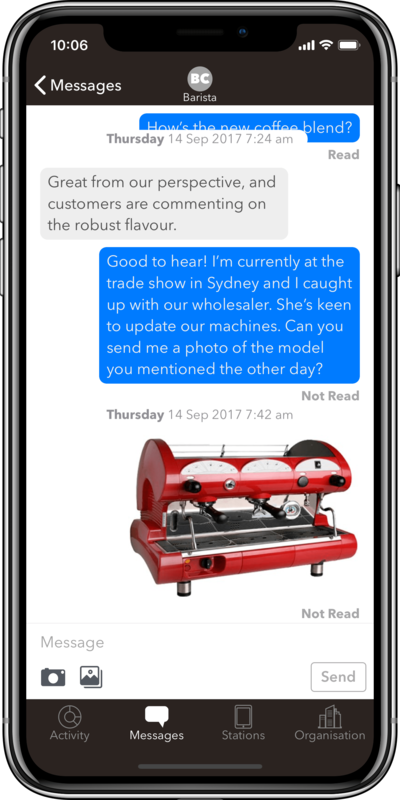 Messages Send and receive instant messages to and from other staff. 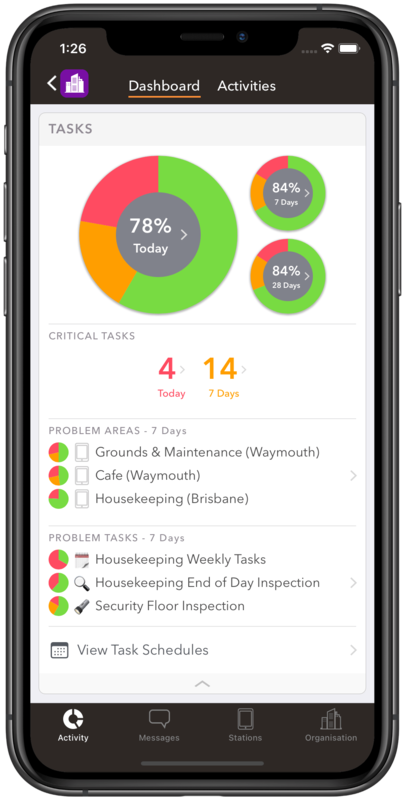 The Systematic app on your iPhone or iPad gives you a real-time view of staff activity, and is your control centre for what appears on Systematic stations. Staff Activity An at-glance report of staff activity. Beautiful graphical reports let you quickly identify problem areas, and areas of excellence. You can dive straight into the details, displaying how long tasks took, and the completed checklists which are the evidence (including photos) that the tasks were completed. Form Inbox View all submitted forms. 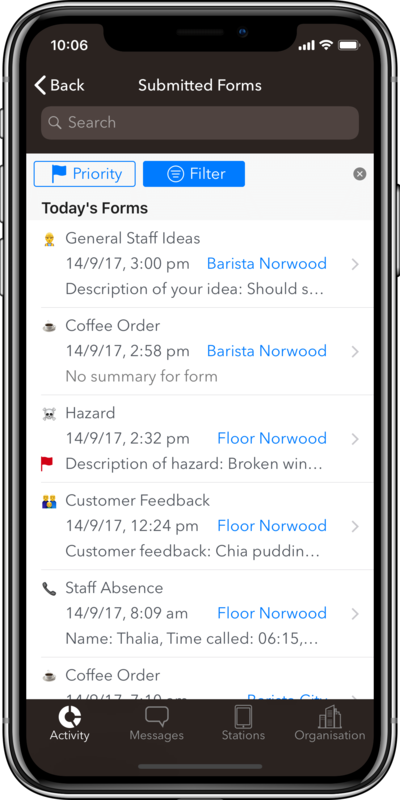 Customer feedback, incident reports, stock reporting… Instantly see if there are any urgent issues needing to be handled.High priority incoming forms (such as report of a critical equipment failure) will trigger an alert to your phone to ensure they’re not missed. Messages Communicate with all staff and stations using the Systematic instant message chat system. 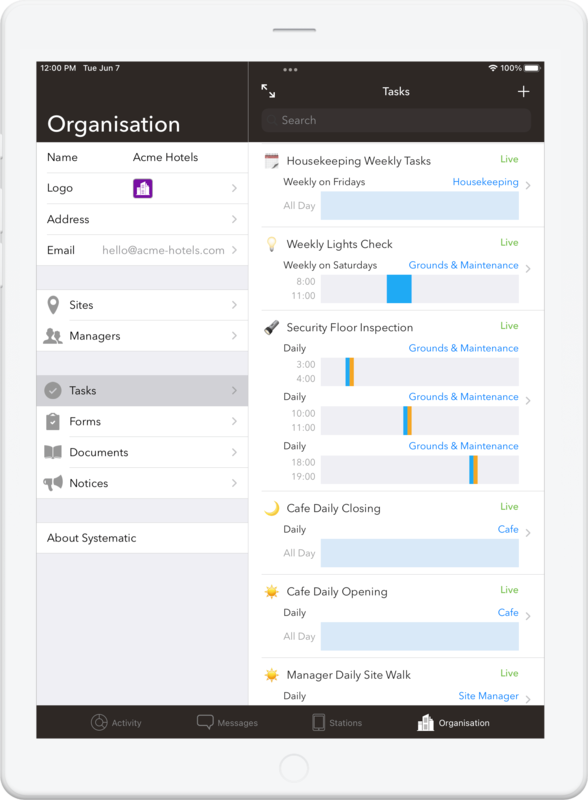 What’s on station Manage your staff’s task schedules, forms, documents, and notices posted to your work areas on the go. Update forms and documents to the latest versions instantly, no worries about old versions circulating. 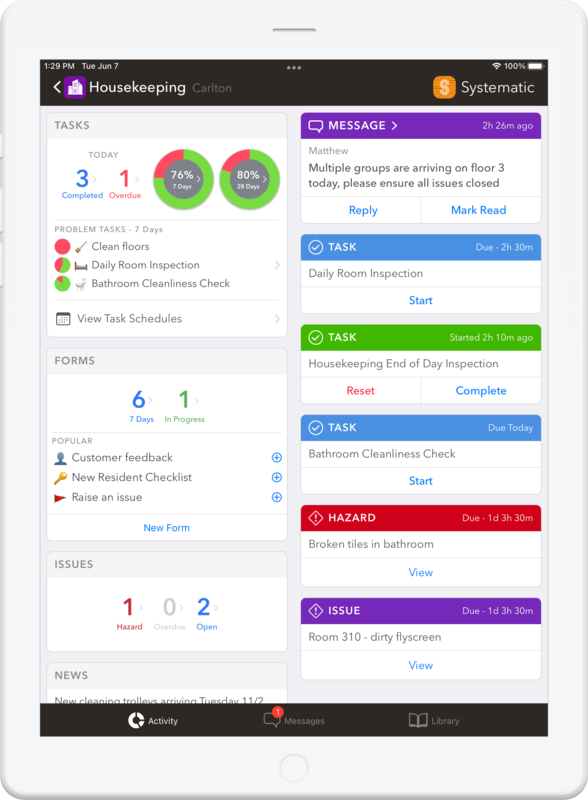 You can quickly check on staff activity, and problems you need to be aware of are pushed to your attention. Systematic helps your business demonstrate your commitment to complying with health and safety requirements. Nothing beats being there, but now when you aren’t around you have records of when staff complete (correctly and safely) crucial tasks such as maintenance, and regular tasks such as closing. Exchanging staff becomes far easier when you can expect them to know what to do, even if they’re not familiar with the section. Managing documents electronically beats printing and handling papers any day. Staff have one place to go for scheduled tasks, forms, documents, as well as a way to contact the manager of their area or other staff. 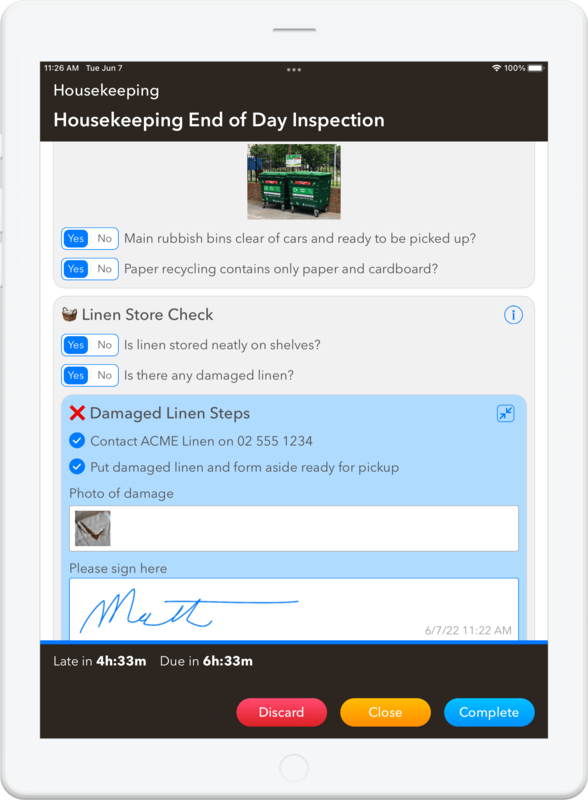 They can fill in a hazard report, attach a picture, hit send, and know it will be handled. All in less time than it would take to just find the printed form. Staff always have guidance on the way to perform the day’s routine. Schedules and checklists will get optimised over time as you and staff refine them. We’ve seen this process produce amazing results. Your most valuable experienced staff will spend less time training new staff. Choose a starter pack when signing up. This will give you task schedules and forms we have found are useful in various businesses. Even if we don’t have a pack for exactly your area, it will give you a good example of how Systematic works. Get expert assistance. Your account includes online support from our experts. Just get in touch.